The FLA Committee is delighted to announce that tickets for its 2019 annual black tie dinner will be available from 11am on Thursday 8 November 2018. This popular event will take place at The Dorchester, Park Lane, Mayfair commencing with pre-dinner drinks from 6.15pm. Further details, including about payment, may be found on the attached flyer. Please note that reservations will only be accepted to this email address and may only be submitted from 11am on Thursday 8 November. Emails received prior to this time or to alternative email addresses will not be accepted. Please also note that a place at the dinner is not guaranteed until payment is received. The FLA’s annual dinner is a popular event and in previous years has sold out within hours. Early booking is strongly recommended. We very much look forward to seeing you at the event. Following the conference there will be a summer drinks & canapé reception at Paternoster Chop House, St Paul’s. Ticket pricing information for both members and non-members is available on the booking website and the member rate is open to members of the FLA, YFLA, ECBA, DELF and PPA. The early bird rate will be available until Friday 18 May. Book now to avoid disappointment! The FLA Committee looks forward to welcoming you on 15 June. The FLA Committee is delighted to announce that tickets are now on sale for it’s 5th Annual Black Tie Dinner at London’s Dorchester Hotel. The event will take place on Friday 2nd February 2018 with a drinks reception from 6:30pm with dinner commencing at 7:30pm and dancing to follow until 12:30pm. For further details of the event including how to reserve a pay for tickets, please see the attached flyer. We look forward to welcoming you at the dinner. Following the seminar there will be refreshments. The event is free for FLA members to attend. Spaces will be allocated on a first come first serve basis, if you wish to reserve your place at this event please email:- membership@thefraudlawyersassociation.org.uk. The FLA Committee is delighted to announce that its 2nd annual conference followed by an evening reception will take place in central London on Friday 16th June 2017. Further details, including speakers and tickets, coming soon. The FLA Committee wishes to express its thanks to everyone who contributed to the success of its 3rd annual dinner on Friday 3 February. 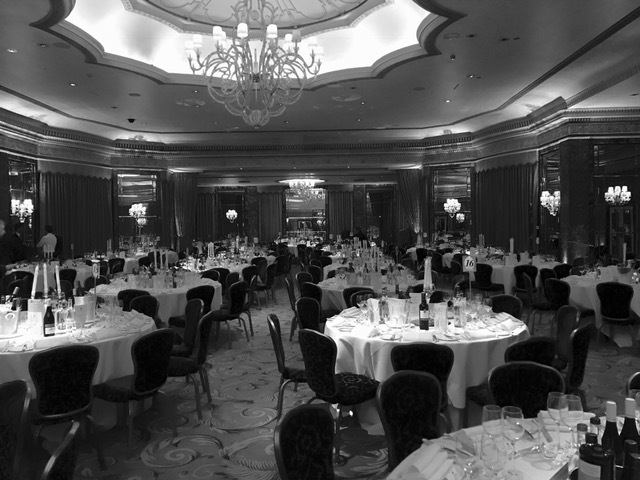 The black tie event, which took place at Park Lane’s Dorchester Hotel, was attended by 490 members and guests from both the UK and overseas. We very much look forward to seeing everyone again at next year’s event. The FLA is delighted to announce that its 3rd annual black tie dinner will take place on 3rd February 2017. Further details, including how to reserve your table, coming soon. The FLA is delighted to announce that Mark Ellison QC of QEB Hollis Whiteman and David Lewis QC of 20 Essex Street will provide a round-up of the year’s relevant cases from the civil and criminal perspectives, looking at trends in both as they have developed this year and what we might expect to see in 2017 and beyond. Canapés and drinks, including mulled wine and mince pies, will be served afterwards. The event is free for members to attend. Evening reception tickets to the post-conference FLA-EFCL Summer Drinks & Canapé Reception are now available for purchase. Offering a unique opportunity to meet representatives from 83 leading firms, Chambers and prosecutors from 13 countries, this drinks and bespoke canapé reception is taking place at OXO2 on London’s Southbank, with iconic evening views overlooking the River Thames to St Paul’s and the City. Tickets are available to both members and non-members of the FLA, EFCL and YFLA, as well as their guests. Details of how to buy your ticket are contained on the attached flyer. The FLA Committee looks forward to welcoming you to this high profile summer networking event. The FLA is delighted to announce further details of its inaugural international conference and evening reception in Central London on 17 June 2016. David Green QC, Director of the SFO, is the keynote conference speaker, followed by a series of seminars on cutting edge issues in corporate crime & fraud presented by leading practitioners from the USA, UK and continental Europe. The conference is being held in conjunction with the EFCL, a sub-association of the ECBA, and is open to members and non-members. Tickets are limited and further details, including how to reserve your place at the conference and/or the evening reception are contained in the attached flier and on the FLA website.